Uniting painting with architecture, New York based artist MarkusLinnenbrink has transformed two exhibition spaces at the kunsthalle, nürnberg into a walk-all-over canvas. 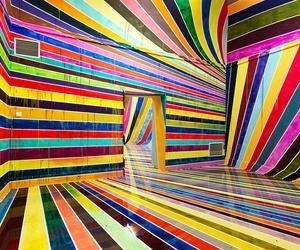 The floors, walls and ceiling of the german site have been pigmented with vibrantly-hued parallel streaks, traversing through the gallery’s rooms.The specific arrangement of the tones and their linear movement sees the line between two-dimensionality dissolve, simultaneously suggesting the idea of an endlessly expanding space. This color adaptation, which linnenbrink has titled ‘wasserscheide(desireallputtogether)’, evokes a wild and psychedelic sense of mobility, with an intensity that the viewer’s eye can hardly follow. Linnenbrink begins by applying transparent layers of paint to the walls, gradually reducing the width of the stripes with applied pigments. Throughout this process, the glazed layers shine through each other, setting the space in motion. The coloration of the walls has a translucent quality reminiscent of watercolor works and running paint drippings left behind bear a texture that is confusingly ephemeral. The effect of the image-space cannot be grasped at a glance — it is activated by walking through the site. Depending on the viewer’s agility and size, various aesthetic, emotional and psychological impacts take shape. Visitors can experience the work presented at the kunsthalle nürnberg from now until December 10th, 2014.